There are of course many reasons for Donald Trump’s appeal to masses of voters, first in Republican primaries—especially open primaries—and now, apparently, among the general voting public. But one powerful reason is the media’s refusal to air conservative ideas. If a Carly Fiorina or a Ted Cruz were to point out that California’s water shortage was the result of successive progressive governments imposing a near-complete moratorium on building new reservoirs even while California’s population doubled; and that California exacerbated the shortage by releasing trillions of gallons of fresh water to the ocean because of a tiny fish, it would not have been news. More specifically, it would not have been on the news. Conservatives have been talking about why California has been suffering from a government-created water shortage for years. Victor Davis Hanson should be brought on as an expert every time a television show does a piece on the drought. But he isn’t, because the media is covering for Democrats in California and in the rest of the nation. If they hadn’t, if they had allowed the debate to play out nationally, Trump would not be able to make it an issue. The resolution might or might not have been a conservative one, but there would have been a resolution that voters took part in. It didn’t get on the news, however, because the news was covering for the left. Now, however, it has made the news, because Donald Trump prefaced those truths with the stretched-so-far-it’s-a-lie statement that Fiorina or Cruz or even Hanson would not have: that “there is no drought”. Thus, the media was willing to cover Trump’s statement where they would not cover the statements of actual conservatives because it allowed them to make fun of conservatives. But it appears to be working for Trump, because people appear to be responding to Trump’s truths even when the media tries to cover them by focusing on Trump’s hyperbolic lies. The reason for Trump’s success is that Trump’s style of campaigning works, and the reason it works is because the media acts as the public relations arm of the Democratic Party. I have no idea if Trump is just bloviating and doesn’t know what he’s talking about, occasionally randomly hitting the truth; or if he is, as Scott Adams thinks, crafty enough to realize that he has to preface truths with controversies that hook the media into reporting his statements. In this case, however, there really shouldn’t be any drought crisis after only five years of lower rainfall in California. One does not talk of a drought crisis when it fails to rain for one day; one rarely talks of a drought when it fails to rain for even a month, depending on the month. A year of no rain might be a drought, but a year of low rainfall really isn’t. Nature has its own cycles and does not care about man’s needs. Five years of low rainfall is a drought crisis only if our use of water exceeds by too much the water that we get and have saved. In 1973 when California began sloughing off their reservoir plans—the now-mostly-abandoned California State Water Project—there were about ten years of reserve. A five-year drop in rainfall would not have been critical in 1973. 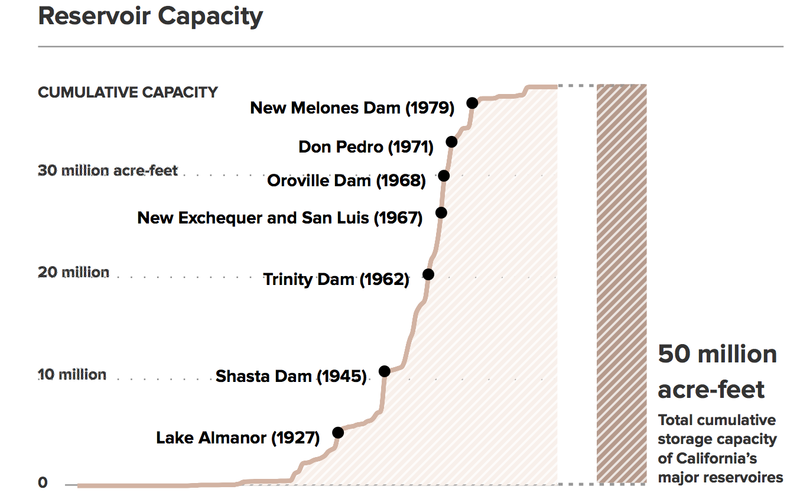 It is critical now solely because California’s progressives abandoned earlier plans to build reservoirs to match population growth. In the four years leading up to 2016’s epic rainfall, California built no new reservoirs. So yes, it’s reasonable to talk of a drought crisis right now. But it’s also extremely important to remember that this drought would not have been critical had it not been for the abandonment of conservative policies by the left. A five-year drought amidst a ten-year reserve is not a crisis. The critical question is, do people care about the drought, or do they care about the drought crisis? Trump appears to be betting on the latter. And had the media allowed conservative ideas into the national debate over the last decade, there would be no crisis for Trump to exploit today, whether you think he’s lying about it or not. A cynic would say that the media has allowed these crises to fester so that politicians on the left could selfishly exploit them. Now that the Republican nominee is also selfishly exploiting them, and also playing on the media’s desire to ridicule Republican nominees, they don’t know what to do except complain about the news coverage Trump is getting. They have been helping liars succeed for decades. It is disingenuous of them to complain now about one they don’t like. This reminds me, actually, of a common headline on the Ace of Spades HQ, of the form X and Y but mostly Y. For example, “Afghan Sniper Dies Due To Lack of Quality Health Insurance and 500 Pound Airburst Bomb, But Mostly 500 Pound Airburst Bomb”. California drought caused by lack of rain and progressive government, but mostly progressive government last modified May 31st, 2016.